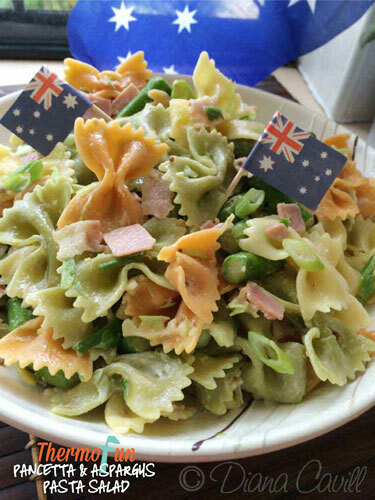 Quick simple and packs some nice flavours this thermomix pancetta and asparagus pasta salad is perfect accompaniment to take (along with some clinker rocky road) to a bbq. If you’re going on a picnic with the family this is a great light salad that won’t weigh down any hiking you may do. It’s also a great salad to have when your in need of a quick dinner – accompany with some “roast” chicken or some shredded chicken as well. I’ve had this recipe since about 2010 after having this dish at a friend’s BBQ. I believe it was out of one of the free Coles/Woolworths books at the time. I love the simplicity, the flavour and also the ease in making the dish. Great lunch dish and also works well with ‘roast’ chicken. Cook pasta in your ThermoServer Click Here for directions. The last two mins add asparagus to ThermoServer. Drain and place into a salad bowl. Add spring onions to salad bowl. Place parsley into TM bowl and chop 5 sec / speed 5. Add to salad bowl. Place pancetta into TM bowl and cook 5 mins / 100°C / speed 1 / MC off. Add to salad bowl. Place mayonnaise, juice, zest and mustard into TM bowl and mix 10 sec / speed 1. Note: if the taste is not tangy enough for your taste add extra lemon rind and juice. Toss mayonnaise through the pasta salad.